Summer is almost here and with it comes exposure to plants and insects which can cause discomfort (to put it mildly). Most people know about poison ivy, sumac and oak, stinging nettles and irritants of that nature, but there are food producing plants can cause uncomfortable if short-lived skin irritation for some people. 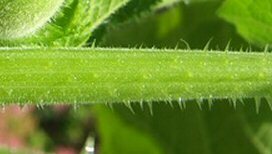 Okra, cucumber and squash plants are a few of them. If you only have a few plants you probably won’t have much of a problem, but if you have a lot to harvest, you may find your hands and lower arms irritated from the the plants. One year after picking a lot of squash my forearms were almost raw, itchy and burning. Gloves make it hard to pick the vegetables and are too short to protect your forearms as well and having your fingers unencumbered make some projects a lot faster and easier. My solution was a simple one. Take a man’s tube sock and cut five slits in the toe, just large enough for your fingers to fit into comfortably. Slip them on your arms and you’re ready to go – your hands and arms up to your elbows are protected. These lessen the scratches you get when trying to pick blackberries, too.